I get a lot of questions about my surgeries, some general questions, some come from Cushing's patients themselves. I don't think I've ever gone into a ton of details before, so here it comes. Q: Did they find the tumor easily? Why did you have 2 surgeries? 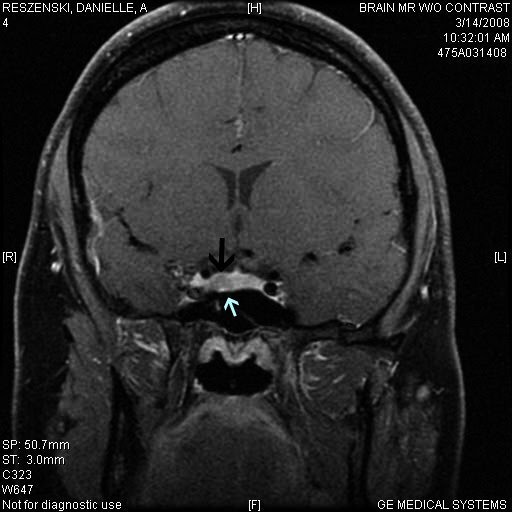 A: I had a clearly marked tumor on my pituitary MRI (see below), but no, they did not find a tumor at all. 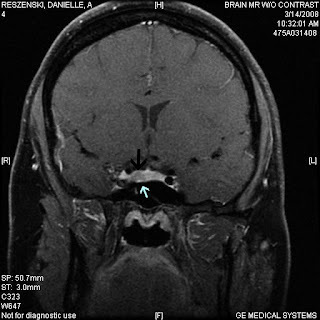 I had a second surgery to remove the half of my pituitary gland where the tumor was. Q: Did you feel any different after pituitary surgery? A: After my first surgery, I felt immediately like I didn't have Cushing's Disease anymore. I felt less swollen, and generally deflated. After the second surgery, I felt the same going in as I did coming out. Q: What medications did you have to take post-surgery? A: The only medication I had to take was dexamethasone. It's a high dose steroid, that I took for a few weeks after surgery to make sure I wouldn't have problems with adrenal insufficiency. Q: Do you still get adrenaline rushes? A: Yes, my brain can still make adrenaline but not as much of it. When faced with a dangerous or anxiety provoking experience, I have the same emotional reaction as anyone, but not the same physical rush. (By the way - most people confuse adrenaline with dopamine, at least the feelings. When you are confronted with something exciting, but something that you enjoy, that's dopamine. When you are confronted with danger, that's adrenaline. Sometimes they overlap). Q: What medications do you take? How do you remember to take them? A: At this moment, I take Cortef 10mg, Florinef 0.05mg twice/weekly, Levoxyl, Liothyrinine, Omeprazole, Ranitidine, and Vitamin D. This changes frequently, the doses anyway. I remember to take them most days, especially the Cortef and Levoxyl, because those medications, if not taken, can make me feel gross. The Vitamin D is a tough one to remember, because it's once a week, but I usually set an alarm on my phone. 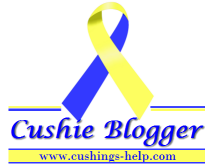 Q: Have you ever had an Adrenal Crisis? A: Yes. I was on vacation, forgot my medications, and had strep throat, but 2 different strains. I had my pills, but no syringes, and made a series of not so great decisions, like driving home before going to the hospital, and not insisting on getting a syringe from the pharmacy. I was in the hospital for almost a week, my blood pressure was dangerously low, and I was delirious most of my stay. I would rather not do that again. Lesson learned. Q: How much weight did you lose? A: I was 285lbs before my BLA, now I am (drum roll please) 150 lbs! (I fluctuate from day to day) So that is a grand total of 135 lbs lost - a whole person. Yay! And no, I did not have to do a whole lot to lose it once I got on the right medication doses. Do you have any questions for me? If so, I'd be glad to answer them!